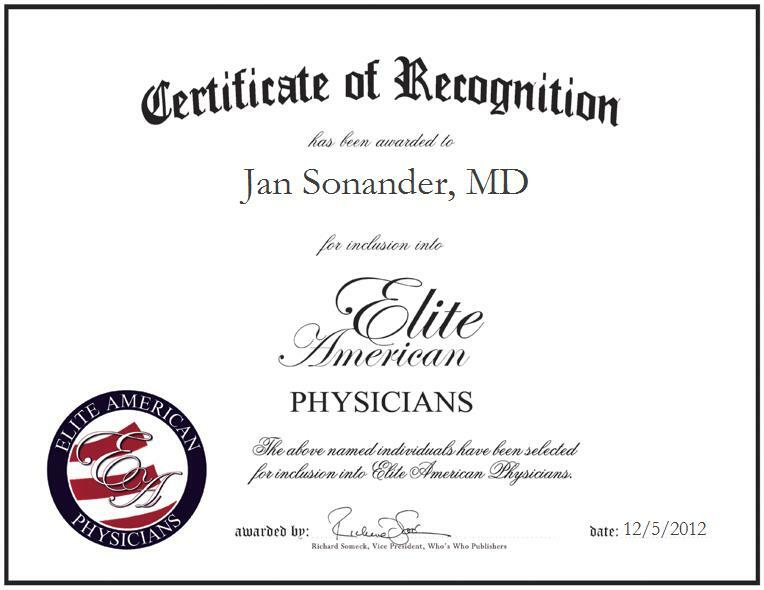 SANTA ROSA, CA, December 5, 2012, Dr. Jan Sonander, Physician, has been recognized by Elite American Physicians for dedication, achievements, and leadership in family medicine. With a sophisticated background in medicine, Dr. Sonander brings forth a sprawling expertise to his private practice in his efforts to help people to achieve optimal health. He has amassed more than 32 years of professional experience, and makes every effort to help the people in his community to live happy and healthy lives. He has garnered a reputation of prominence and distinction over the course of an illustrious career for his commitment to helping others and making a difference. Dr. Sonander is a recipient of a myriad of industry-related awards. This year, he was named the Best Doctor of Sonoma County, and he also recently received The Press Democrat Leader’s Choice Award. Dr. Sonander also received a Patient Satisfaction Excellence Award, as granted by the St. Joseph Health System of Sonoma County in 2009. Dr. Sonander feels that his longevity and commitment are key factors that separate him from his peers. Throughout his career, Dr. Sonander has remained diligent in his endeavors to assist the people of Sonoma County and its surrounding areas in many ways. He is primarily responsible for seeing patients and overseeing his private practice; he has been in the same practice for 22 years. He builds relationships and truly cares for his patients. Dr. Sonander earned a Bachelor of Science, a Master of Science, and an MD, all from the University of California, Davis, and went on to become a Board Certified Physician through the American Board of Family Medicine, Inc. Dr. Sonander is also the Chief of Staff for Santa Rosa Memorial Hospital and the former president of the Sonoma County Medical Association, and he is a member of the California Medical Association and the American Academy of Family Physicians.